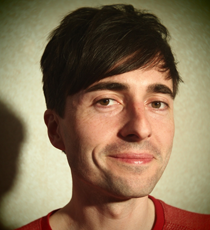 Danny Robins is a presenter, comedy writer and journalist. Danny is an experienced radio presenter. He has presented the long-running weekly Indie Travel Guide on Lauren Laverne’s award-winning BBC 6Music show, hosted his own series on BBC Radio 1, fronted hour long docs for BBC 6Music and contributed to many 5Live shows. He’s a regular voice on Radio 4, performing his own series Danny Robins Music Therapy, guesting on shows such as Front Row, Saturday Review and Jon Ronson On, and winning a Radio Academy Award for his documentary work. Danny has travelled widely, working as a presenter for the Travel Channel and also writing a monthly column for Ryanair’s inflight magazine. He has a special interest in things Scandinavian, via his Swedish wife, and has presented several documentaries on Sweden and Scandinavia. He currently writes and stars in his own Radio 4 semi-autobiographical sitcom The Cold Swedish Winter. As a BAFTA and RTS award winning comedy writer and performer, he’s worked with such greats as Ronnie Barker, Dara O’Briain, Lenny Henry and Armando Iannucci and created hit shows including CBBC’s Young Dracula and BBC 2’s We Are History. Performing live, Danny’s stand up career began aged 15 in his hometown of Newcastle. He’s had great success at the Edinburgh festival, especially with his acclaimed DJ Danny shows.